Michael McGuire is one of a number of successful Australian journalists who have segued into writing thrillers. Joining the likes of Tony Jones, Michael Brissenden, Steve Lewis and Chris Uhlmann. The thing about journalists is that they tend to know how to spin a good tale. And McGuire is no exception. 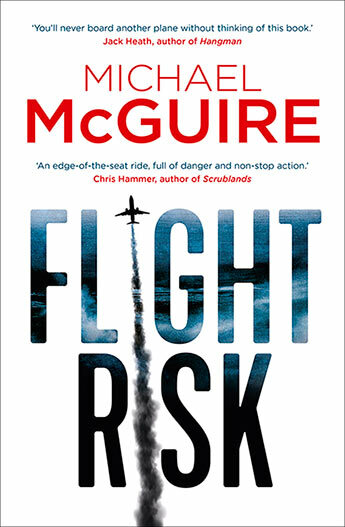 But in some ways, his position of a little too much knowledge of the genre hampers his second novel Flight Risk. Flight Risk is built on the very real (still unsolved) mystery of Malaysian flight MH370 which disappeared between Kuala Lumpur and Beijing. The book opens with a Garuda flight from Sydney to Jakarta disappearing mid-flight. Ted Anderson, former airforce and commercial pilot, and slightly rogue secret agent, working for an Australian spy agency that is more secret than the official Australian spy agency, is called in to investigate. Ted jets off to Jakarta to check up on the pilot of the missing plane where he runs into the Americans who have concerns of their own and are not too happy with Ted playing in their sandpit. Soon another plane has disappeared and then another. Through a tangled series of events, Ted ends up as a passenger on a plane that he thinks is going to go the same way and it turns out he is right. Flight Risk has an irresistible hook. Ever since 9/11, the fragility of the global air travel system has been high in people’s minds. And the mystery of MH370 still looms in the global consciousness. Bringing these together, with reference to other famous uses of aircraft by terrorists, gives what could be an outlandish scenario the flavour of realism that it needs. And despite plenty of exposition and scene setting, McGuire manages to create a feeling of unease from the start. The middle section of the book, when Ted starts to get to the heart of the mystery is the most effective and creepy. But then the narrative finds itself quite self-consciously in James Bond territory. To the point where the mastermind of the whole plot says to Ted (who he refuses to kill for… reasons) that he is not going to monologue because that is what a James Bond villain would do. Of course, later, he does just that (mainly because the limitations of a first person narrative demand it). Ted himself is a bit of an off the shelf action hero character: a military past, a tragic backstory, a healthy disregard for authority, handy in a scrap. But McGuire has not gone down the route of many Australian authors and crafted an American protagonist. Instead, for Australian lovers of this type of thriller he has delivered a refreshing, laconic, almost too laid back for his own good, Aussie hero. It just so happens he is also a ex-pilot which makes him perfect for this mission. McGuire handles the action scenes, including a chase through a Jakarta apartment block and a cockpit scuffle, well. But after dropping its big reveal, Flight Risk runs along some very familiar tracks – psychopathic mastermind, evil scheme to take over the world, hero left alive by psychopath to witness the start of said take over. But it is always enjoyable and action fans will find plenty to keep them turning the pages. There is plenty left unresolved at the end of Flight Risk. McGuire clearly has a series in mind.